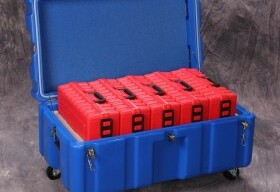 Master case, gasketed with removable caster wheels; designed to hold 5 of the 20 capacity classic Turtle cases. Does not include 20 capacity Turtle cases to be stored inside. However these may be included at a discounted cost. Large gasketed container will hold five of the LTO 20 size Turtle cases. Configured this way it will hold 100 LTO tapes. 4 latches, two are lockable (with padlocks, included) to secure the container, 2 steel padlocks included as well as four removable caster wheels. The 20 capacity classic Turtle cases may be purchased and included in the shipment. When.